In order to develop cosmetics that not only are gentle on the skin, but also satisfy customers, we incorporate the latest technologies and ingredients while reflecting the trends of the times and customer needs. We avoid ingredients that could cause skin problems and instead value naturally derived ingredients. Our products never contain synthetic surfactants, paraben, phenoxyethanol, ethanol (*2), mineral oil, pigments, or fragrances. Reflecting our belief that formulating the cosmetics that come into direct contact with the skin using natural substances that have been a familiar ingredient since ancient times is the most comfortable for people as well as the gentlest on the skin, we are committed to using naturally derived ingredients in our products. Surfactants are an essential part of creating cosmetics, but synthetic surfactants have powerful effects and may cause issues such as skin irritation. *2 Except ethanol used to manufacture extracts. ※A We test ingredients using the Kat Sod Assay , which was developed by Professor Hajime Nishioka (1934-2014), who served as a professor emeritus at Doshisha University, and for which Professor Tomohiro Matsumoto of the Kyoto University Graduate School of Biostudies Radiation Biology Center is now responsible. This test method makes it possible to directly observe active oxygen generated by the test ingredients using genetically modified cells. Faith products use only ingredients that are shown by this test method to not generate active oxygen. 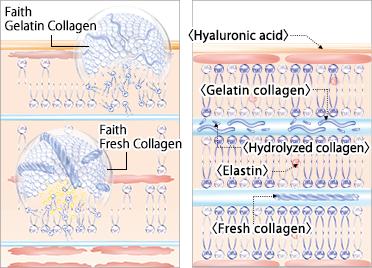 The skin’s stratum corneum consists of keratinocytes and lipids between keratinocytes, the latter of which includes substances such as ceramide, fatty acids, cholesterol, and phospholipids arranged in layers to form a lamellar structure (*3) that serves to maintain the skin’s barrier function by ensuring sufficient moisture and oils. Phospholipids consist of two parts, one of which is hydrophilic and one of which is lipophilic. When the inside of the stratum corneum is adequately supplied with phospholipids, the skin is characterized by the ability to retain moisture, good protective function, and a beautiful appearance. 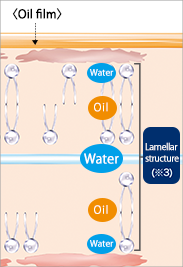 A damaged lamellar structure cannot retain moisture, causing the skin to become dry and develop problems. The surface of the stratum corneum is protected with an oil film. (1) Moisture in the stratum corneum is kept from evaporating. (2) The oil film protects the skin from external irritants. (3) When this film is eliminated by washing the skin, the skin’s moisture can no longer be retained. *4 In this context, “skin” refers to the stratum corneum. with Faith’s unique Lamellar Beauty Method. “Faith Fresh Collagen” (*5) and “Faith Gelatin Collagen” (*6), which can deliver collagen that ordinarily cannot permeate the skin to the stratum corneum, moisturize and protect the skin by maintaining the stratum corneum. Together they make possible the Lamellar Beauty method, which beautifies the skin from the inside out. (1) Collagen and hyaluronic acid moisturize the outside (surface) of the skin. 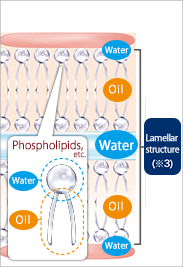 (2) Natural phospholipids maintain the stratum corneum (by moisturizing and protecting it). (3) Collagen and elastin strengthen the ability of the skin (stratum corneum) to retain moisture, giving the skin elasticity. “Faith Fresh Collagen” and “Faith Gelatin Collagen” maintain and moisturize the skin. They also help maintain the skin’s barrier function.